Can Sanyo improve its game with its latest LCD? 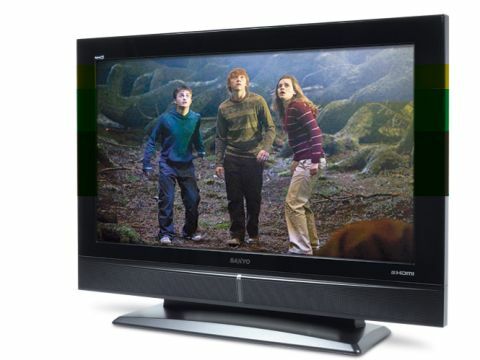 Once a big player on the UK TV market, Sanyo’s influence has rather waned in the face of constant price pressure and huge ranges from so many larger rivals. Maybe the new CE32LD81-B can put the Japanese company back on the map? Its combination of an eye-catchingly low price, together with a bold design, will doubtless win the set many admiring glances from punters hunting for a bargain. The connections are up to the job, too, as twin HDMI, component video and D-Sub PC options ensure it keeps up with the Joneses. The set can’t take 1080p feeds, but we’re not too fussed by this on a 32in screen. Alarm bells do start ringing when we find a decent native HD Ready resolution of 1,366 x 768 pixels joined by a slightly disappointing claimed contrast ratio of 1,200:1 that raises fears of an uninspiring black level response. The set’s dated onscreen menu system holds precious few features of note, either, other than a film mode for enhanced motion handling when watching movie sources and a noise reduction system. It doesn’t take long watching the CE32LD81-B to realise that it certainly isn’t going to resurrect Sanyo’s dwindling reputation. For starters, we found a really horrible operating flaw whereby, if an HD source switches between different output resolutions (as Sky’s HD receiver does if set to auto mode), the TV either crashes, or else a picture appears but without any sound for over a minute. Truly bizarre and totally rubbish. As with so many small, affordable LCD TVs, the CE32LD81-B also struggles to portray a believable black. Instead it bottoms out into grey, and leaves the darkest picture areas looking strangely hollow and somehow dislocated from the rest of the picture. Colours look noticeably off-key during dark scenes. Yet another problem is that HD pictures don’t seem especially crisp. You can tell you’re watching HD rather than standard definition, but detail levels aren’t that acute, and moving objects tend to lose more resolution than with the rest of our contenders. This Sanyo isn’t unremittingly bad, though. Its pictures are quite bright, and surprisingly it handles SD pictures quite well, with less noise than many. Plus, its audio is pretty decent.